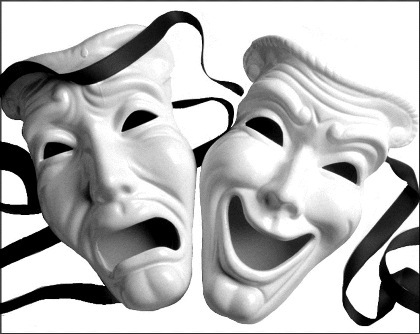 Mental Health and More...: "Jamison, you're an actor!" Today's blog includes some personal information. While completing my masters degree in counseling several years ago, a prominent professor told me over and over that I was an "actor." He would say it with a smile on his face and a twinkle in his eye. However, the observation bothered me. I didn't know what he meant. Did he mean I was a fake? Did he mean that I was pretending? I don't know why the thought scared me so badly. Just with those questions one can surmise that I tend to lean to negative self-assessments. It's ironic that a therapist who strives to demonstrate unconditional positive regard to his clients struggles with doing the same with himself. That's a story for another day, though. Back to the story at-hand. Me, an actor! Sure, I had done some acting in high school. The occasoinal musical or skit, but that was not how I looked at counseling. I was striving for genuineness and honesty, and the professor's assessment seemed the opposite...until yesterday. A friend I hadn't seen in 12 years contacted me online and asked for a referral for his child. I researched his area and gave him some contacts. A month later he contacted me, again thanking me for the information I had provided. He then shared some personal sentiments regarding the experiences we had in common. Much of his description was similar to how I had felt about the experience, which was painstakingly difficult to overcome. While reading, I found myself going over a fantastical scenario of how I might speak to him if he were present with me, rather than communicating electronically. (It's an exercise I do with frequency). I found that my emotions began to reflect more of what he was describing, as well as my mental verbage. I recognized this process, because I know for a fact that I had resxolved my issues that are similar to his and have been at peace with it for some time. I was in the roll as a therapist and a person who is trying to be empathetic. It makes me wonder if that is what the professor meant by his comment. I am more inclined to believe so. Perhaps "acting" means putting yourself in the position of someone to be able to reflect what they may feel or think and is a means of connection. What do you think? Absolutely Jamison, it is called "empathy". You become "one" with the person. Mind Meld. Remember Spock?